Eagles are birds of prey. They are used as the emblem of the Aldmeri Dominion, and elven weapons and armor often have eagle motifs. Tusked creatures with pointed hooves and large antlers. They are found mainly in Wrothgar and serve the Orcs as livestock and beasts of burden. Those found in the wild are usually hostile. Young echateres are called echalettes. 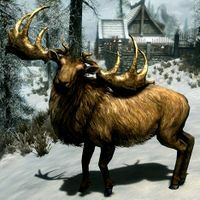 Elk are a species of large mammals found in parts of Skyrim and High Rock. Like the similar Deer, they are very skittish and will quickly flee from potential danger. 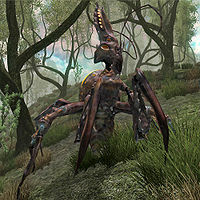 The Elytra are large mantis-like creatures indigenous to much of the Shivering Isles. Although there is a marked color difference between the Mania and the Dementia Variety, they're otherwise identical. They are found in high concentrations in root tunnel systems and near caves, but inhabit almost the entire Isles. Some Elytra secrete a glowing green substance known as Felldew, prized as a powerful, addictive drug. A type of fish that can be found on Stros M'Kai. 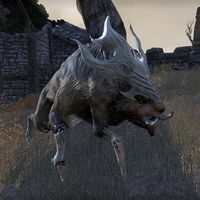 A type of fish that can be found in Cyrodiil. 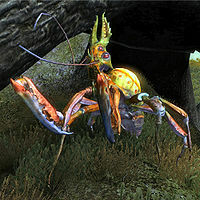 Emperor Crabs were gigantic crab-like creatures once native to Vvardenfell, contemporary with the early settled Chimer. The species died out long before 3E 427. 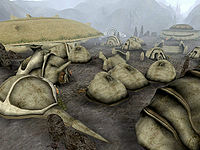 The most famous Emperor Crab was called Skar, and its giant shell was incorporated into the city of Ald'ruhn. "Under Skar" was the manor district of the settlement, and housed the leaders of Great House Redoran as well as several merchants. Ald'ruhn was destroyed during the Oblivion Crisis by the Daedric armies of Mehrunes Dagon. A type of saltwater fish that can be found on Auridon. This page was last modified on 1 September 2018, at 17:32.